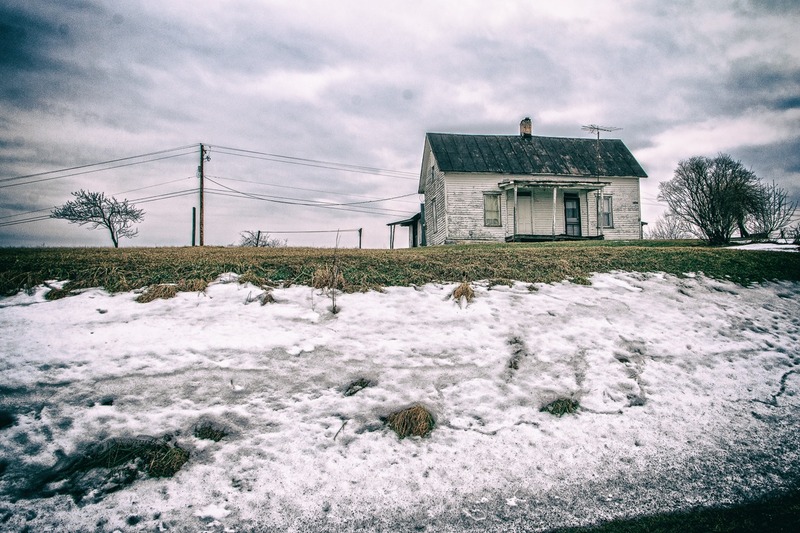 We pick up the narrative again in relating a frigid February 2015 expedition into the snow-covered hills of northeastern Ohio Appalachia. As I write, a year later, the weather outside my window is not so different from what we see here, so I am channeling my inner Yeti. I’ve been finding taking photographs in snowy conditions is rather interesting; snow can really change the character of a photograph, whether landscape or otherwise. It has both a visual effect—the addition of so much white into a photo frame—and a psychological effect, creating distance, loneliness, sometimes purity. Had I taken this photograph in the middle of summer, I think this same pastoral scene would be a lot more welcoming. I think the presence of the cattle here, adding a living presence, makes it a little less forbidding. This photograph was taken in the middle of nowhere. The closest settlement is the tiny unincorporated hamlet of New Rumley, Ohio, settled during the War of 1812. George Armstrong Custer, the controversial cavalry officer, was born in New Rumley, pretty much the place’s only claim to fame. 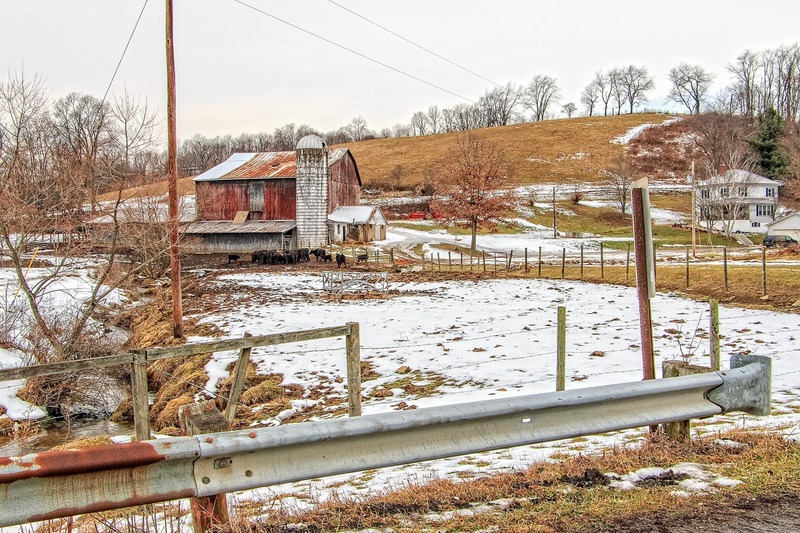 This region of Ohio, still only a county away from the Ohio River, is hilly, wooded, and often economically stressed. 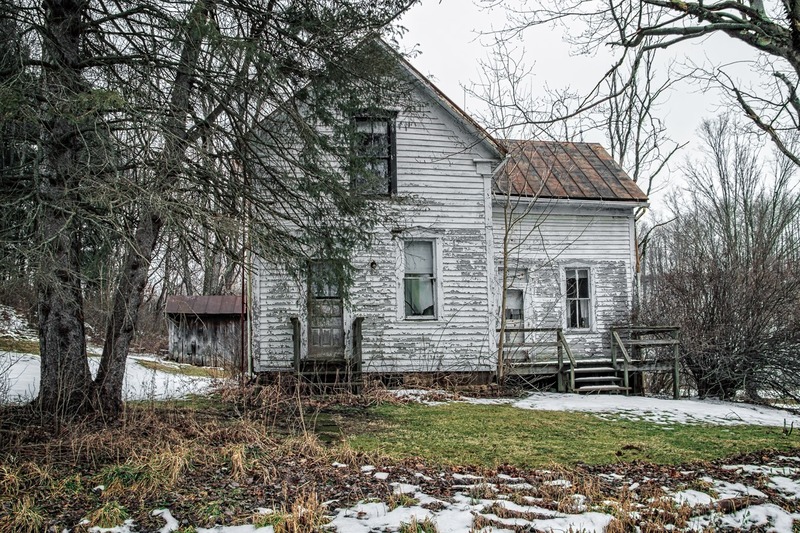 Harrison County, where this photo of an aging house was taken, is one of the least populated counties of Ohio. 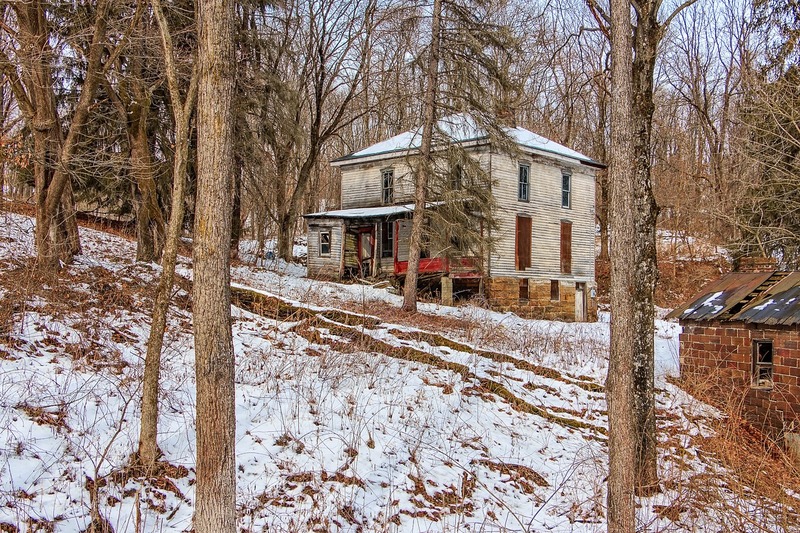 From this angle, the place seems to be hardly more than a shack, but appearances can be deceiving. 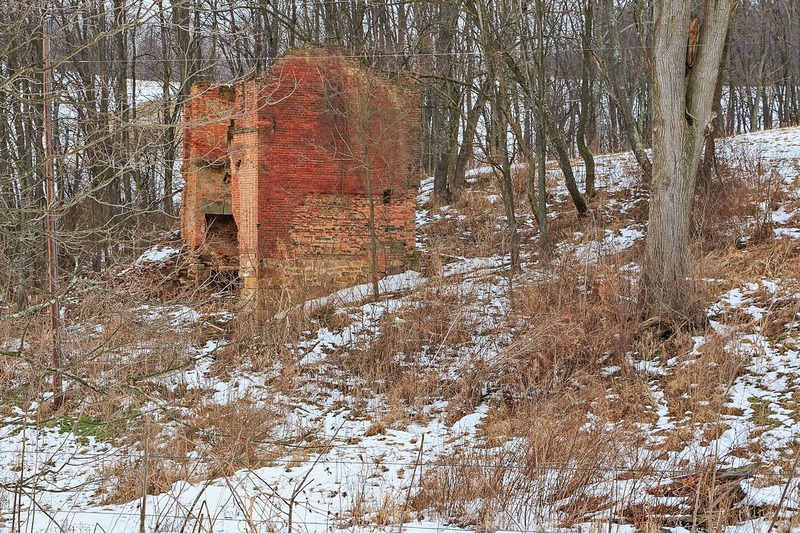 Driving down one remote road I came across a curious sight—the ruins of what once was a multi-story brick building. Judging by the age of the brick, it seems likely that this building dates from the early 1800s, making it quite old. Only one wall and two opposite corners are left standing; it is not even clear what the nature of the building is. Although some sort of residence is the most likely explanation, it could also have been some sort of workshop. 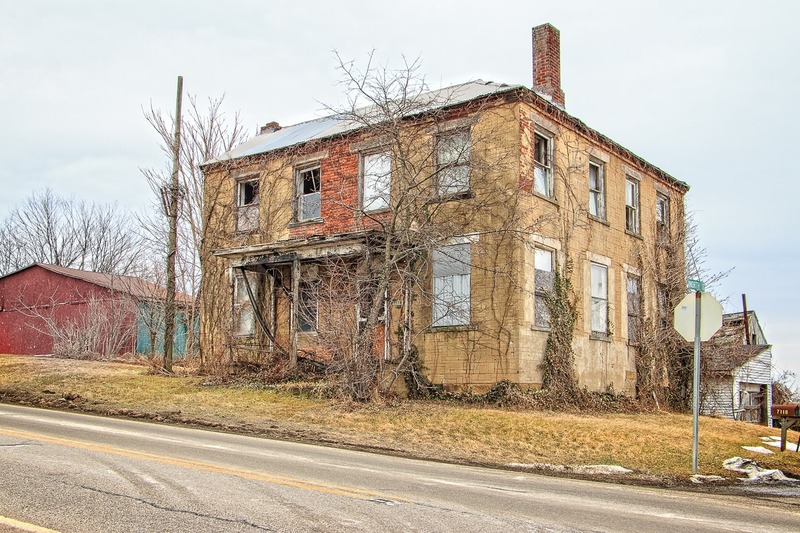 I’ve never seen a ruin like this in my travels across Ohio, in which the corners of the building remain but the walls, internal and external, are gone. As often happens, the foliage and the angle of the road did not give me as nice a view of the ruins as I would have liked—one reason why I am considering purchasing a drone. From this angle, though, taken further up the road, looking back at the ruins, we can more clearly see the one wall that is more or less intact. A close-up reveals the age of the bricks. 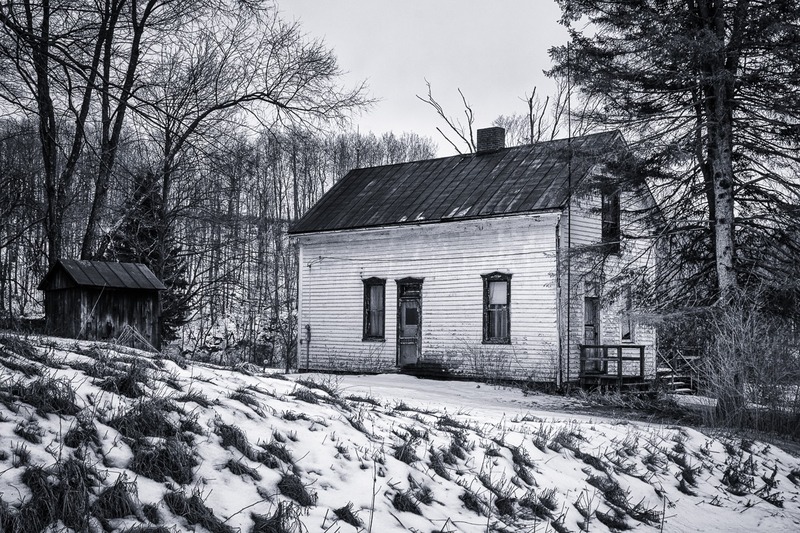 In the portions that remain, there are no windows, no doors, and very little detritus, as if it had been partially away—or simply scattered over the decades. What a mystery! This much newer, but nevertheless also abandoned, place is a bit less mysterious. This was quite the solid house at one point, but now the porch is collapsing and eventually other parts will follow. Eventually I made my way into the tiny hamlet of Amsterdam, Ohio (population 511, salute! ), founded by a Dutch immigrant in the early 1800s. Like a number of similar tiny communities that dot the hills and valleys of eastern Ohio, Amsterdam was once a larger version of its present self. It reached a population peak of 1,271 in 1920, but has steadily declined over the last century. The reason is almost certainly the decline of the coal mining industry in the region, which began during the second quarter of the 20th century. 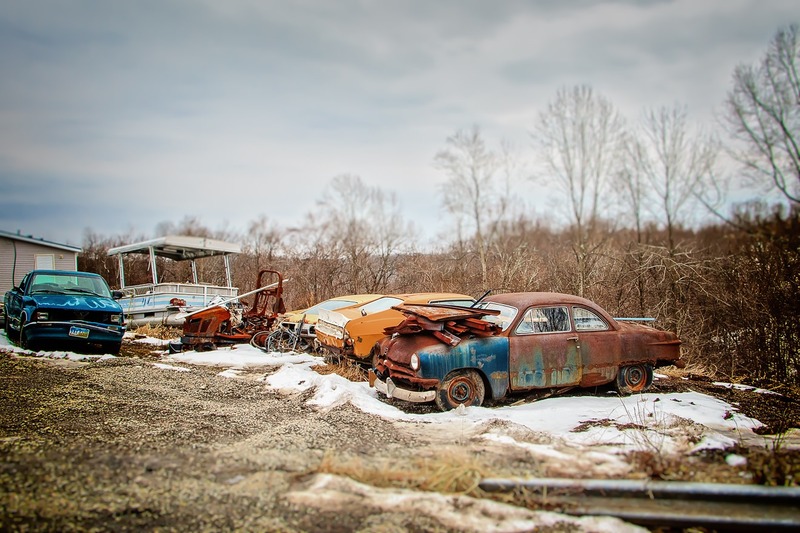 In all likelihood, a number of the residents left for better prospects working in the steel mills or auto plants of northeastern Ohio—which themselves would begin to go bust a few decades later. There still is coal mining in the area, of course, but at a much lower level than a century ago, as the easiest-to-get-at, highest quality coal has long since been mined out. 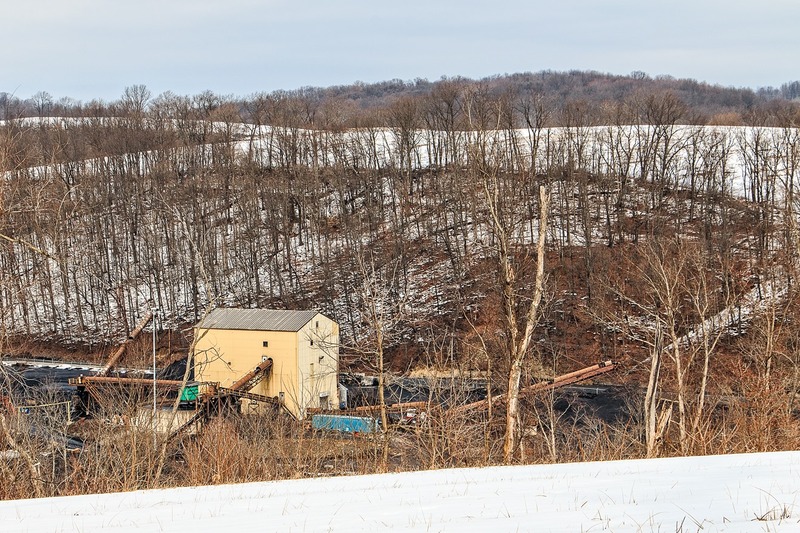 Above is a photograph of what I believe is the wash plant for Sterling Mining (part of East Fairfield Coal), which operates a couple of nearby coal mines. Here various processes are used to remove ash and other impurities from mined coal before it is shipped to power plants or other customers. This plant is located about eight miles east of East Liverpool. The wash plant represented the furthest point in my journey; I soon turned around to head southwest and homewards. This took me through the tiny hamlet of Bergholz, Ohio (population 664, salute!). By the standards of other communities in the region, Bergholz is quite the newcomer, having been founded only in the 1880s. 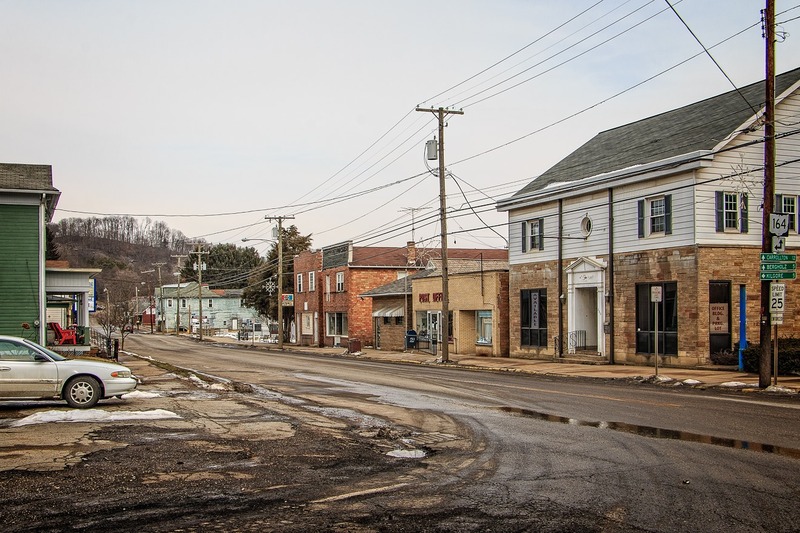 It was coal mining that was responsible for the town’s creation—which, as you might suspect, means that Bergholz has experienced a long decline. It reached its population peak in 1920 at 1,215, which means Bergholz is only half the town it once was. A few years ago, Bergholz got some unexpected national publicity thanks to a criminal case involving beard-cutting attacks on local Amish by 16 members of a fringe Amish offshoot. 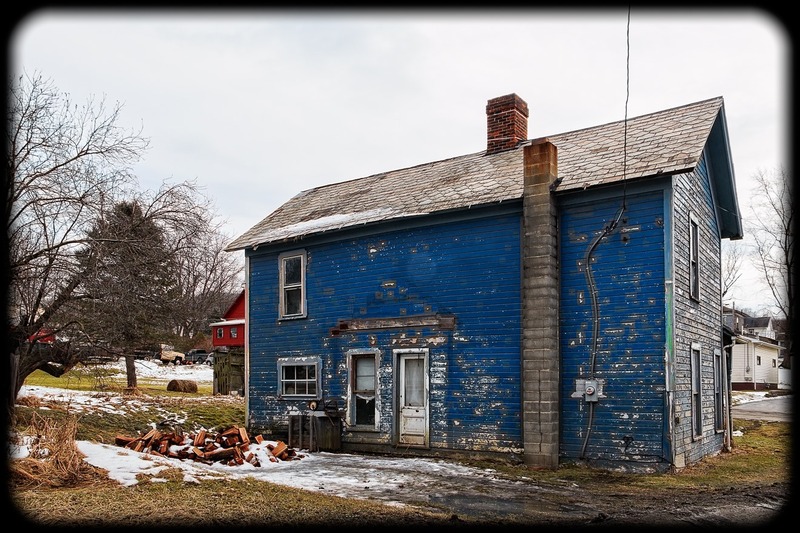 Above we see a dilapidated but very very blue house. 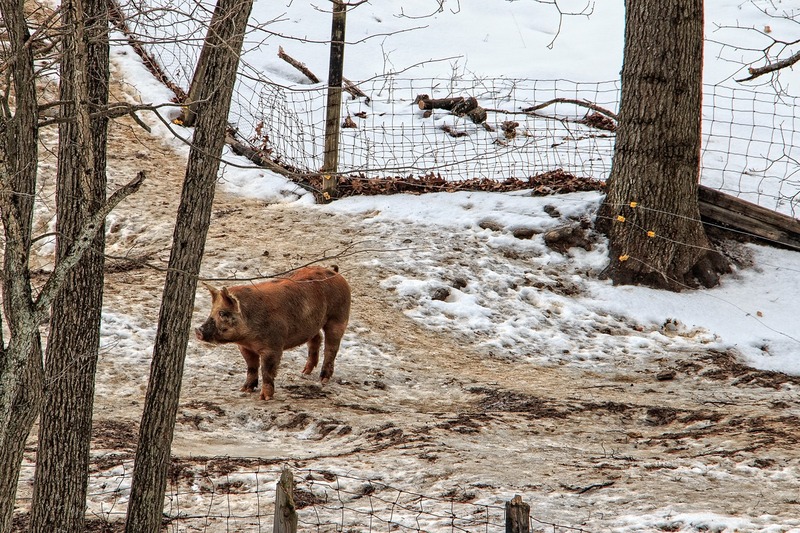 At times I thought I was the only living being going around in the cold and ice, but every now and then I would find a fellow sufferer, such as this lonely pig who looks as if it would rather be pretty much anywhere else than here. Another of the countless hamlets I drove through on this excursion was the unincorporated community of Harlem Springs (salute!). 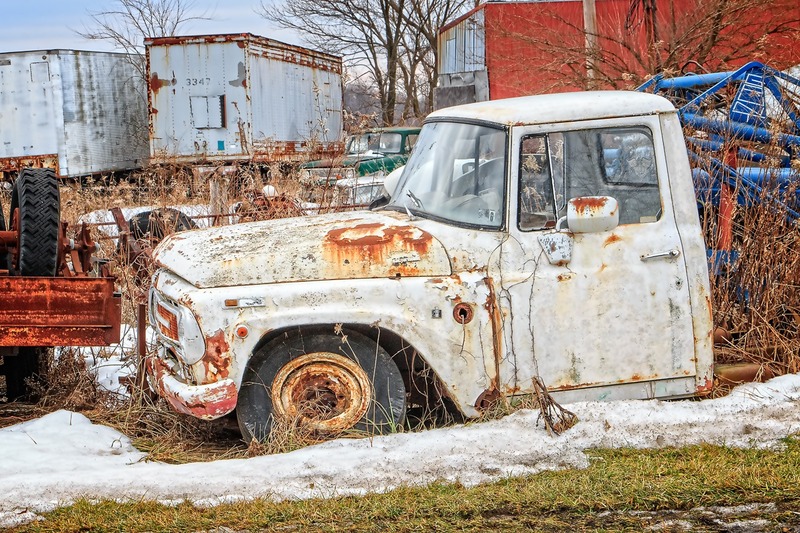 A bit outside of Harlem Springs was a collection of various junked trucks, including this old tow truck. It seems to have been fashioned using a 1960s or early 1970s International Harvester Campermobile. Notice the word “Grunt” on the towing rig—I thought this might be a brand name but, if so, I could not confirm it. 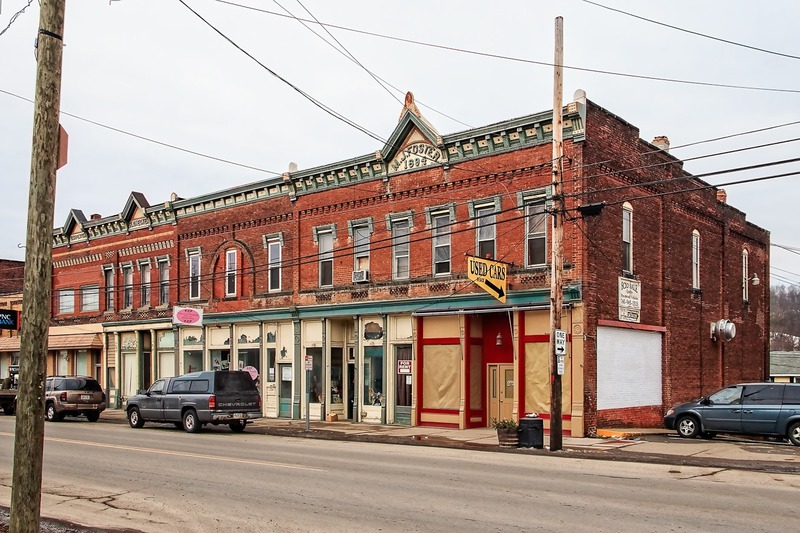 Kilgore, Ohio, is yet another microscopic hamlet in eastern Ohio. It is unincorporated, so I don’t know the population, but it can’t be more than 500 or so. This abandoned building can be found in Kilgore. A bit to the southeast of Kilgore is the village of Scio, Ohio (population 763, salute!). 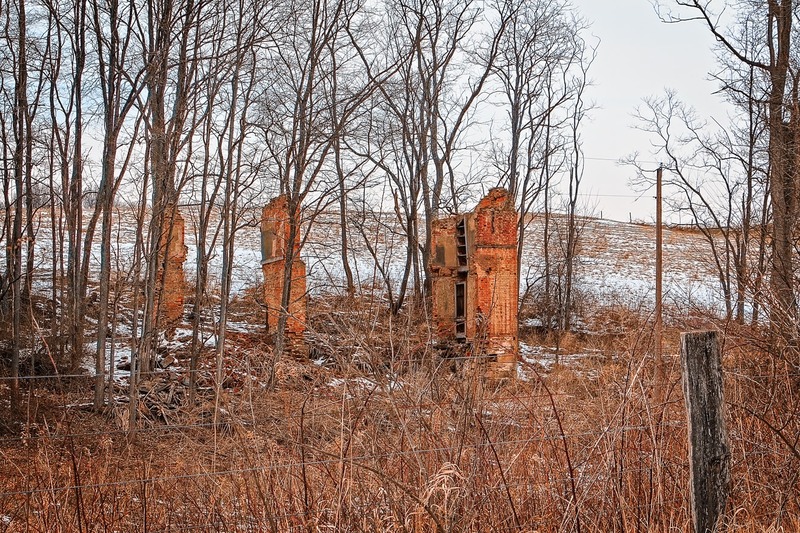 It’s another former coal-mining community that once had a much larger population than it does today. Kilgore’s main drag doesn’t look too much different today than it did more than a century ago. This building block was built in the 1890s. Today, however, more of the businesses are vacant than occupied—the signs of the times. 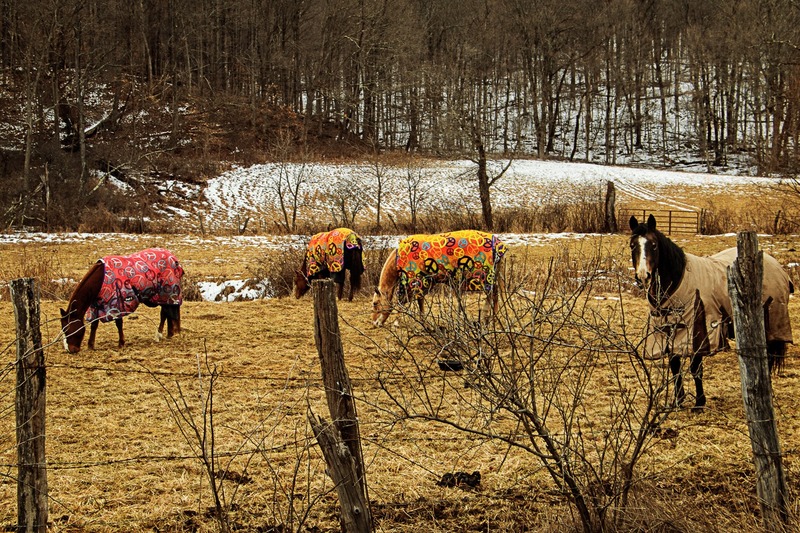 Amazingly, even a few people were out and about on this cold day—and what is more, they were recreating! 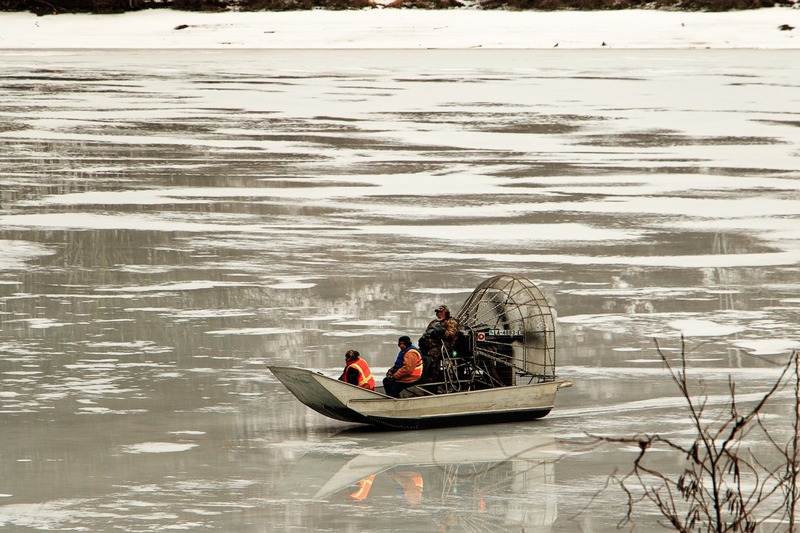 Ohio is not exactly known for its winter sports, but here a group of people are enjoying themselves on the partially frozen Tappan Lake, an eastern Ohio reservoir (at the bottom of which are a couple of former settlements). I guess people find this fun, but when I watched them speed/slide across the lake, all I could think of was how cold they must be. 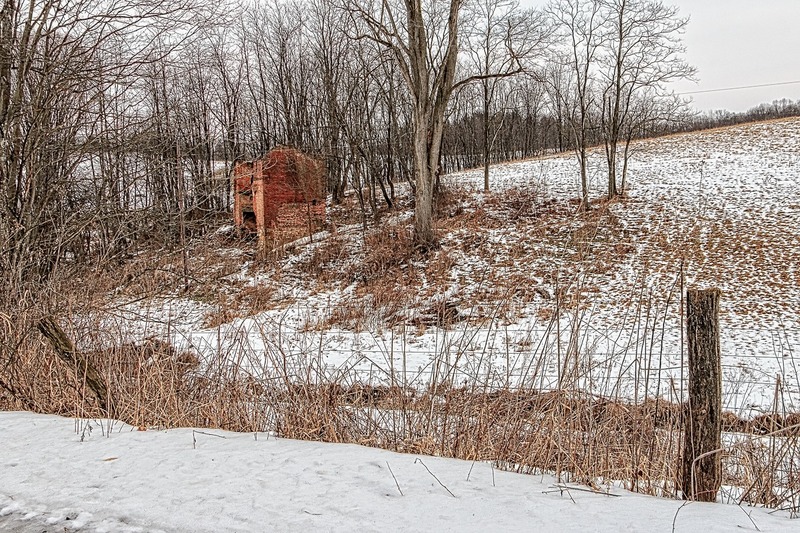 Here’s a desolate shot of an abandoned little shack. My camera’s GPS battery must have finally drained by this point, so I cant tell you exactly where I took this shot, but it was still somewhere in far eastern Ohio. This car is such a cute little vehicle (I don’t know the make/model, so please let me know if you recognize it) that it is a shame that it was left outside to rust away in the way it has. It clearly once looked cool and sporty. Having taken that last shot, I decided that the warmth of hearth and home sounded pretty good, so I put my camera away and hastened home, to my own little haven. in this great, gentle, green land. Keep up the good work. Tim, thank you very much for that compliment. I am so happy that you have enjoyed the blog! I am from the Amsterdam, Bergholz, Harlem springs area,, great pictures!!!! I love it! !